Philip B. Auerbach, President and Founder of the Auerbach Global-Impact Foundation (AGIF) announces the appointment of Michael A. Krafft to the organization’s Board of Directors and as its Treasurer. 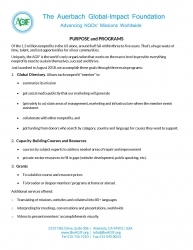 Just launched officially in late August 2018, the Auerbach Global-Impact Foundation (AGIF; www.theAGIF.org) presents a unique, comprehensive, one-stop resource for all nonprofits to advance and enhance their missions because half of them (1.5 million in the US) fail within three to five years. Alameda, CA, September 27, 2018 — Philip B. Auerbach, President and Founder of the Auerbach Global-Impact Foundation (AGIF) has announced the appointment of Michael A. Krafft to the organization’s Board of Directors and as its Treasurer. Michael A. Krafft is the CEO of M&A Media Group, a financial services firm. For more than 20 years, he has built deep funding relationships with leading strategic and institutional investors, private equity funds, and venture capital firms as well as the World Bank, IMF, EBRD, OECD, and OPIC. He has also served on many other US and international nonprofit boards. “Having travelled around the US and in over 55 countries, including in the developing world, I have seen first-hand the critical needs that nonprofits address,” said Philip Auerbach. “With 1.5 million nonprofits in the US alone, half fail within three to five years. While all nonprofits seek more funding, it’s more essential to reverse this failure rate so that far more can be sustainable, succeed and thrive. Greater success will magnify their ripple effect and impact communities worldwide,” he continued. Just launched officially in late August 2018, the Auerbach Global-Impact Foundation (AGIF; www.theAGIF.org) presents a unique, comprehensive, one-stop resource for all nonprofits. After registering in AGIF's Global Directory, nonprofits can get donations; nationwide publicity; training by renowned experts in marketing, management, leadership and other areas; relevant private-sector resources; grants to subsidize their capacity building; translations of their listings, collateral or websites; videos; and grants to broaden and deepen their impact in more communities. For almost 30 years, Philip Auerbach has headed Auerbach International Inc. (www.auerbach-intl.com), a global marketing and language-services agency that expands companies, organizations and governments into countries and cultures. The company has donated over 20% of its profits to seed the AGIF. Company clients range from Fortune 100 firms to small and medium enterprises; other nonprofits; and local, state and federal governments. In prior years, Mr. Auerbach worked for three US publishing companies, a nonprofit in San Francisco, and for a public entity in Africa. He has also studied eight languages; taught at the university level; has a BA in Japanese Studies (1975) from Earlham College in Richmond, IN; and has a Master’s of International Marketing (1981) from the Thunderbird School of Global Management in Phoenix.